I often like Mark Wahlberg in movies, but with the exception of Boogie Nights, I like him in supporting roles like The Departed so much better than when he is the focus of the film. I do always go into movies with as clean of a slate as I can, though, attempting to give every movie a fair shake and always wanting to like what I’m watching. So when The Fighter showed up, a movie starring Wahlberg, I heaved a sigh and dived in, hoping that Wahlberg might rise to the level of his best roles. Thankfully, he does, and he’s got a tremendous supporting cast to help him over the line. The Fighter is the mostly-autobiographical story of boxer Micky Ward (Mark Wahlberg) and his half-brother, boxer Dickie (spelled “Dicky” in the film) Eklund (Christian Bale). This is both a standard boxing story and a very different one in some ways. We’ll get a lot of the boxing tropes that have been around since boxing movies, but there’s also a great deal of social commentary going on here. While the tropes certainly exist in the movie, it’s worth noting that a great deal of this is based on the real life and experiences of Ward and Eklund. When the film starts, Micky Ward has lost a few fights and is looking to regain some confidence. Dicky is being filmed for an HBO documentary that he thinks is going to be about his attempt to come back as a boxer. The truth is that the documentary is High on Crack Street: Lost Lives in Lowell because Dicky Eklund is a crack addict who has ruined his boxing career. He’s starting to affect Micky’s career as well, not showing up for training. Micky is also not helped by his mother Alice (Melissa Leo) or his seven(!) sisters and half-sisters who seem to move everywhere in a massed group and who talk constantly. The one person who does seem to be looking out for Micky is his father, George (Jack McGee), who sees that Dicky is unreliable and an addict and that Alice, who works as Micky’s manager, is lining up bad fights for him. When Micky does get a chance at a fight and the boxer is forced to drop at the last minute, they tell Micky to fight the replacement, despite that boxer being a good 20 pounds heavier. Micky takes a beating, which damages his confidence even more. George also introduces Micky to Charlene Fleming (Amy Adams), a former athlete-turned-bartender, and the two begin dating. Dicky descends further and further into drugs, eventually getting arrested for attempted scams and Micky is injured trying save his brother from a beating at the hands of the police. Eventually, Micky decides to hang up his gloves, but is convinced back into the game by his father and Charlene under the condition that Dicky and Alice aren’t a part of his comeback. What follows is Micky’s comeback under the training tutelage of Mickey O’Keefe (playing himself) and Dicky’s getting clean in prison. The real story, though, is the changed and strained relationship between the brothers and especially between Micky, Charlene, and the rest of Micky’s family. 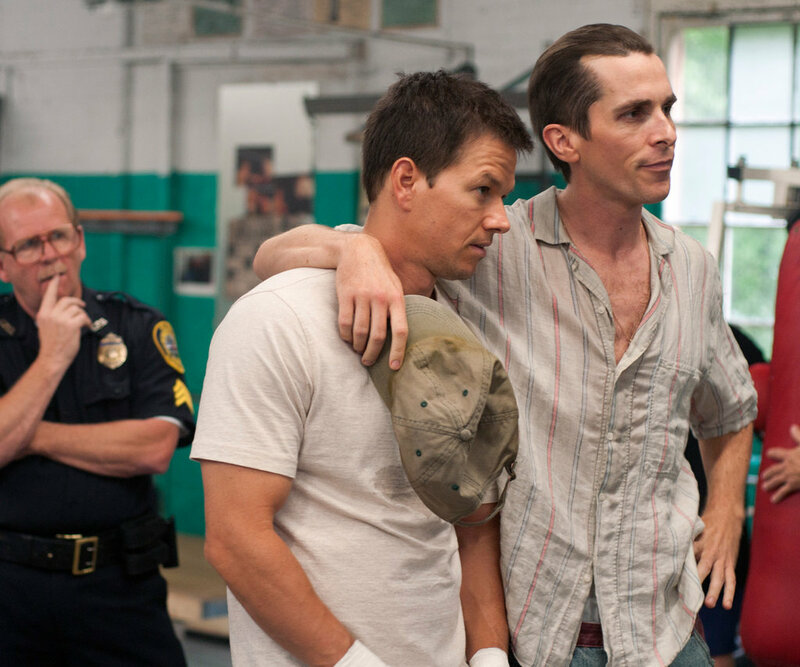 The Fighter tells a good story, but it’s really the performances that sell it. Christian Bale, Melissa Leo, and Amy Adams were all nominated in supporting roles and both Bale and Leo won for these roles. There’s a lot to unpack here. First, this might be Bale’s best role in front of the camera. He’s mesmerizing, both fascinating and frustrating at the same time, and I can’t really think of anything to say in the negative. I think I’d have rather seen Amy Adams win for the supporting role, but I also understand that this may simply be a case of liking her character more than Melissa Leo’s. I’m a little surprised that Mark Wahlberg wasn’t nominated, because this is just about his best work in front of a camera as well. It’s also a role that shows his dedication, since he started training for it years before the film was made to get himself into shape. He also didn’t fake the boxing, and took some real punches in the fight sequences. If there’s a complaint here it’s that the film takes frequent breaks from the real story of Micky Ward in terms of his fights and who he fought. It also leaves off his fights against Arturo Gatti, which were probably the most important fights of his career. Sure, they weren’t a part of his comeback, but they’re critical to the real story of Micky Ward, and not having them here feels like a miss. Still, I have a hard time not liking this. The family relationships are oppressive in places, but I think that’s probably the realest part of the film. Watch this to see a quartet of talented people at the top of their acting game. Why to watch The Fighter: It’s some of the best work of some very talented people. Why not to watch: Frequent breaks from reality, and it leaves out Ward’s biggest fights.